This was Slahi’s description of how he was betrayed by his home country, as delivered at a hearing in Guantánamo in 2004 to assess his status as an “enemy combatant” who could be held without rights, and essentially, to rubber-stamp that designation. They were the words I first encountered when researching Slahi’s story in 2006, for my book The Guantánamo Files, and they reflect the Slahi who emerges from Guantánamo Diary, his extraordinary memoir, written at Guantánamo over a decade ago, but not published until January 2015, after the US government finally allowed a redacted copy to be published, which has since gone on to become a New York Times best-seller, and has been translated into numerous other languages. He had aroused US suspicions because he was related to Abu Hafs, the spiritual advisor to Al-Qaeda (who … opposed the 9/11 attacks), and because, while living in Germany in 1999, three would-be jihadists, including Ramzi bin al-Shibh, an alleged facilitator of the 9/11 attacks, had stayed for a night at his house. The Obama administration, however, appealed that ruling, and the appeals court in Washington, D.C. — the D.C. Circuit Court, which, at that point, was disturbingly dominated by right-wing ideologues — vacated Judge Robertson’s ruling, sending it back to the lower court to be reconsidered, where it has languished ever since, mocking all notions of justice every day it has remained unaddressed. Finally, Slahi will have another option to ask for his release, when a Periodic Review Board — a high-level governmental review process that functions like a parole board — reviews his case on June 2, although there is no certainty that he will be freed, if he does not impress the board members. Absurdly, no one in a position of power and authority in the US seems to find it shameful that a best-selling author, who has done so much to expose the horrors of the “war on terror,” remains held, when, if some foreign power had imprisoned an American without charge or trial, who then wrote a best-selling book about his ordeal, but continued to be held, the outrage in the US would, to put it mildly, be immense. Slahi’s treatment also, of course, explains why so much of what passes for evidence against the prisoners at Guantánamo — statements produced by the prisoners themselves, or by their fellow prisoners — is so fundamentally unreliable. As Der Spiegel noted in an article when Slahi’s book was published, “After weeks of torture, Slahi decided to give his torturers what they wanted: He began talking, implicating people he didn’t know and delivering one false statement after the other. He was rewarded for it as well. Even today, Slahi is a privileged prisoner at Guantánamo, with a television and computer, and he’s even allowed to grow his own herb garden.” That “privileged” position, however, has a darker side, as he is also isolated, especially since the other “privileged” prisoner who, for some time, was his neighbour, Tariq al-Sawah, an Egyptian, was freed in January this year. For a detailed write-up of Tuesday’s event, see this post by Aisha Maniar of the London Guantánamo Campaign, and if you want to do more, please sign this new ACLU petition to defense secretary Ashton Carter, launched on Tuesday, which already has over 15,000 signatures, asking for Slahi to be freed, and please also sign the Change.org petition to Ashton Carter, launched by Yahdid Ould Slahi, which currently has over 14,000 signatures. The photos accompanying this article were taken at the Parliamentary briefing, hosted by Tom Brake, the Liberal Democrat MP for Carshalton and Wallington, who had been approached to host it by a new friend of mine, Susie Sullivan, who, with her husband Bernard, has been supporting my Countdown to Close Guantánamo campaign since I launched it in January. Bernard told me on Tuesday that Susie had been so moved by Slahi’s book that she had decided that she had to do something as a result, and so the two of them looked for MPs who might be supportive, and found Tom Brake, who did a great job organising the event and hosting it. In a packed Grimond Room, seasoned Guantánamo campaigners, plus Clive Stafford Smith of Reprieve and former prisoner Moazzam Begg, heard actors Sanjeev Bhaskar and Toby Jones read from Slahi’s book, and also heard from his brother Yahdih Ould Slahi, who lives and works in Germany, his lawyer Nancy Hollander, Jo Glanville, the director of English PEN, and Jamie Byng of Canongate Books, Slahi’s UK publisher. It was a moving evening. The readings were compelling, and speaker after speaker spoke of how eloquent, funny and devastatingly powerful Slahi’s account is, and how it really should fatally undermine any trace that might remain of credibility for the US’s brutal and colossally inept “war on terror,” which still continues with Slahi himself as one of its victims. If you’re in the UK, please also ask your MP to sign the following letter to Ashton Carter, and to contact Tom Brake if they are willing to sign it. Mohamedou Slahi has been unlawfully imprisoned by the U.S. government for 14 years. Thirteen of those years have been at Guantánamo Bay prison, where he was subjected to gruesome torture. Mr. Slahi has never been charged with a crime. He has never taken part in any hostilities against the United States. A former chief military prosecutor in the Guantánamo military commissions, Colonel Morris Davis, has said he couldn’t find any crime with which to charge Mr. Slahi. [Note: In a 2013 interview with Slate, Davis recalled, “In early 2007, we had a big meeting with the CIA, the FBI, the Department of Defense and the Department of Justice, and we got a briefing from the investigators who worked on the Slahi case, and their conclusion was there’s a lot of smoke and no fire”]. At long last, Mr. Slahi has been granted the Periodic Review Board hearing he should have had five years ago. At this hearing he can prove he’s not a threat to the United States and that there is no reason to continue to hold him. Despite all his suffering, Mr. Slahi has repeatedly stated — including in his best-selling book — that he bears no ill will towards anyone. 1. Immediately certify to Congress that Mr. Slahi will be released. 2. Ensure that Mr. Slahi is quickly transferred out of Guantánamo Bay so he can restart his life as a free man. 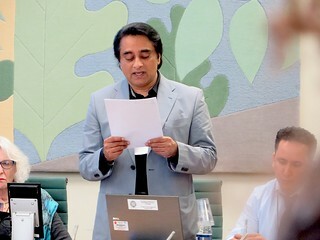 Here’s my latest article, linking to my photos of – and reporting about – the Parliamentary briefing on Tuesday for Mohamedou Ould Slahi, the best-selling author and ‪Guantanamo‬ prisoner, which featured the actors Toby Jones (pictured) and Sanjeev Bhaskar, reading from his book, “Guantanamo Diary,” and speakers including his brother and his lawyer. Imagine writing a best-selling book that exposes your torture and abuse and the lack of a case against you, and then still being held year after year. It is a horrible travesty. “Make America ‘Great’ Again”. CLOSE GITMO..yesterday. Yes, it certainly is, Rose Ann. US citizens are generally encouraged not to think about Guantanamo, and yet, as soon as you pay it even the slightest bit of attention, it becomes apparent that the whole place is horrendously unjust. Slahi is not Yemeni so he would probably be sent back to Mauritania by Christmas if the PRB did approve his transfer. Mauritania had no problem accepting back Ahamed Abdel Aziz. Yes, agreed, Martin. There is a great deal of support for his release, which I don’t imagine will sway the board members, but it will have been noted by the administration.